Maple Logistics provides customized supply chain management solutions for businesses and eCommerce clients in diverse markets including business, education, publishing, retail, consumer packaged goods (CPG), apparel, and manufacturing. 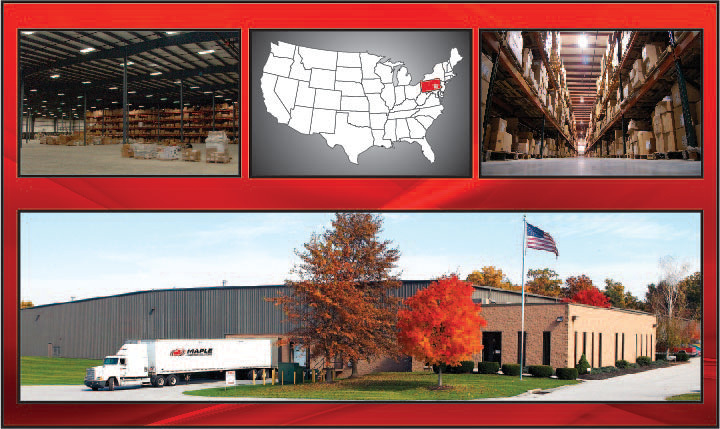 Our warehouse and fulfillment distribution centers are located in South Central PA with close proximity to major metropolitan centers including the Harrisburg, Baltimore, Washington, Philadelphia, and New York markets. Our ideal Northeast location provides easy access to eastern ports and ground deliveries reach the majority of the United States population within 2 days. Domestic and international shipments from our warehouse locations in York, Lebanon, and Mount Joy, PA exceed over 20,000,000 items shipped annually with over 95% of our fulfillment orders shipping within 24 hours. All of our warehouse locations are clean, secure, and food certified. Our location and expertise allows us to provide a cost effective third party warehouse and fulfillment option (3PF) in a variety of industries.